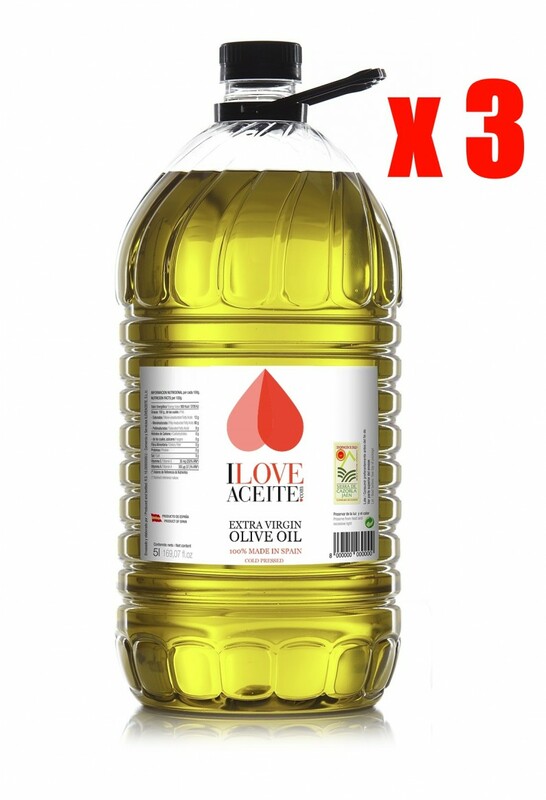 ILOVEACEITE WHITE LABEL 5 L | 1.3 gal | PET (CASE 3 UNITS) | Extra Virgin Olive Oil | Picual variety | Protected Designation of Origin PDO Certified | Picking Early Olives (Case 3 bottles x 5L = 15 L l 4.00 gal) extra virgin olive oil (EVOO) Picual varietal. Early picking. PDO Certified This oil comes from olives selected and milled in early November which gives it charm and expectation of taste and enjoy pure liquid essence of the olive in the ultimate expression of their "extra virgin". Very deep green color, reminiscent of the olive color, well away from veraison. The smell is penetrating, fresh unripe fruit, especially tomatoes. Its flavor is powerful, very intense, floods the palate. Point itch-bitterness characteristic of the variety, very sharp. Vigor in structure while balanced, good body and patents character. Pterygium were munching on their density, and of course, his remarkable persistence in the mouth, where we left her notes artichoke. Optimal for palates who like smell and taste of wild fruits still in the maturation process.